Comics In 5 Panels: Manga-Mania May: Death Note. Light Yagami is a young man who pretty much success in all he does. And dear god, is he bored! Being 17 years old, and therefor still stuck in school, Light miss a challenge for someone as gifted as him. And that he gets the day he finds the "Death Note". After going through the pages of the little black book, Light comes to the conclusion that the book is most likely a prank, since it claims that whoever name is written in it will die. 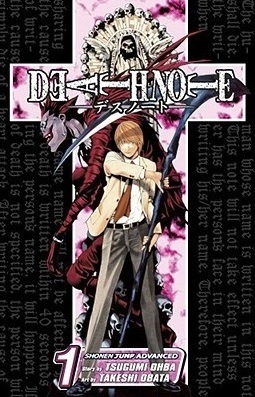 But after testing the book on a bicker-gang, Light realize that the "Death Note" is no joking matter at all. As long as he knows the name and face of whoever he wish to write into the book, they will die. Light makes it his mission to clean the world for criminals, one by one, and thereby create a utopia were everyone will realize that crime really do not pay. But there is a bump on the way toward utopia. A bum by the name L. He is the worlds greatest detective, and since no one knows his name nor seen his face, Light cannot kill him. This is the start of a duel between this two men duo to them having different concept of justice. Who is smart enough to expose the other, and thereby achieve victory? Don't get me wrong, I do like reading manga-comics with a lot of talking(once in awhile), but it's, well, a little too much. As the manga goes on, there is a lot of "I knew that you knew" followed by "I knew that you knew that I knew," and so on. It can be a bit tiring. And another thing: It gets less interesting once Light goes crazy. Look, I may not be the biggest Death Note fan, but I could see it's charm. Like Light's sick, but brilliant mind. He gets that you cant just write names carelessly in the book. He plans allot, and evolve the use of the book to it's fullest. But SPOILER after killing L, he wasn't the same. I get that the point was that he had won, and was therefor relieved, possibly even got lazy, but that's not the same as saying that it's good storytelling. I just kinda lost the interest after that. Am I saying that it's a bad manga? HELL NO! It's very well written, has good art, and is one hell of a thriller. But I just dont like it, that's all. But that's just me, someone else with more patience than me will probably have a blast with this manga. Everyone should read Death Note at least once. I may try to reread it and see if the other half of the book still bores me, or if I will learn to appreciate it. That's all for today, 4 to go.